Gettysburg Flag Works is proud to offer a free half-staff email service. 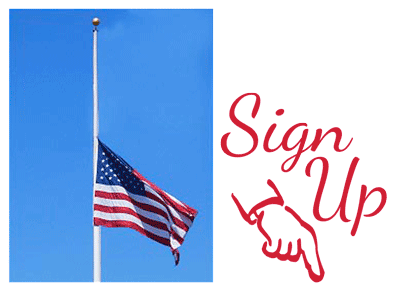 Sign up below and we will email you anytime your American flag or State flag should be lowered to half-staff . We'll scan the President's proclamations and all of the Governors proclamations and get the details to you in your inbox. And it's all FREE! Drop your favorite email address into the bar below and choose what state you'd like to monitor as well as a few interest options that you can choose to get news about. We will not share or sell your information. This is purely for flag related information.